ETFs with solid momentum are currently focused on tech, health care and small-cap. Only 18 of 2051 ETFs passed our momentum screening filter rules. 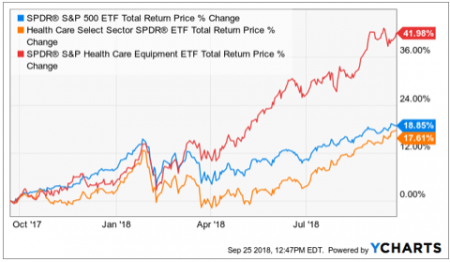 We further subjectively evaluated quantitative and qualitative data for the 18 and selected medical equipment ETF XHE as an addition to our tactical sleeve. For those clients who complement their core strategic positions with a tactical momentum rotation sleeve as part of their Personal Investment Policy, we have added the medical equipment ETF (XHE) to those tax deferred accounts where we have discretion; and we recommend that addition for those accounts for which we provide advice. That advice is to clients only. For readers here, this article is for information purposes only, and is not personal investment advice. Total Dollar trading volume over 3 months greater than the 3-mo total volume ending 3 months ago. From the current 18 survivors of that filter out of 2051 ETFs, we subjectively evaluated other quantitative and qualitative factors, to select XHE for addition to tactical momentum rotation sleeves. To remain in the portfolio a tactical position must continue to satisfy the minimum conditions on a weekly review basis, except that the total return, if greater than that of T-Bills, need only exceed that of the S&P 500 by 2%; and trading volume growth is not required. A position might be replaced with a more attractive tactical selection if the total amount allocated to the tactical sleeve is fully invested. The following presents some, but not all, of the information we used in addition to our rules-based filter to make our selection. The next two charts effectively demonstrate the recent historical momentum and superior performance that suggests the likelihood (but not certainty) of short-term inertial continuation of momentum for XHE. This shows the 1-year total return of S&P 500 (SPY in blue), S&P 500 Health Care Sector (XLV in orange), and S&P Total Market Medical Equipment (XHE in red). This shows the relative total return performance of SPY, XLV and XHE over the past 3 years. 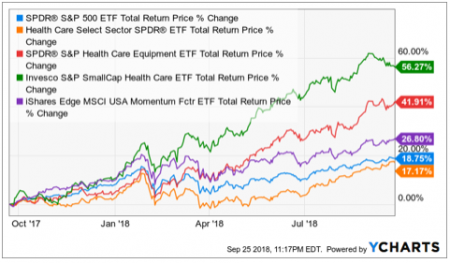 The next two charts add another healthcare ETF (PSCH) currently in our tactical sleeve, and also as a useful comparison, the iShares momentum factor ETF (MTUM). 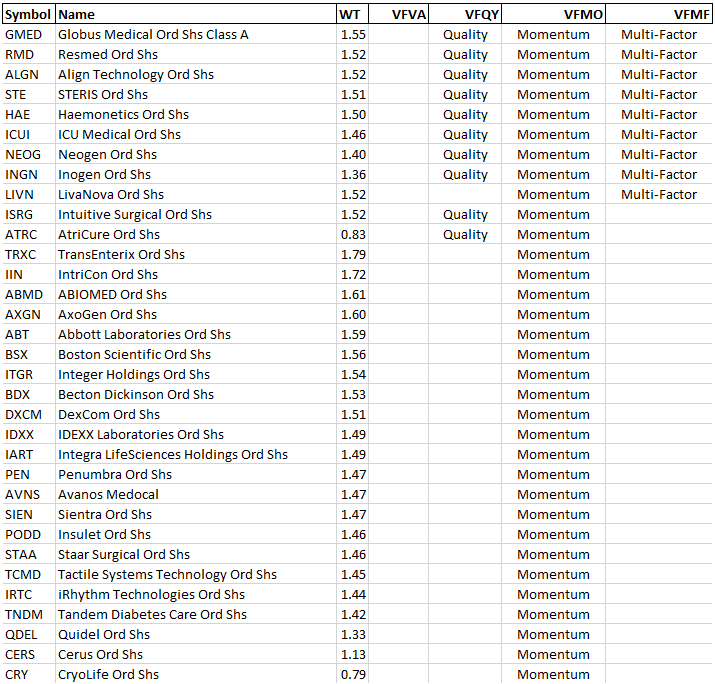 Currently, of the 18 momentum ETFs identified by our filter, they are all small-cap, technology, health care, except for one retail ETF. Additionally, you can see the volatility (standard deviation) and Sharpe Ratio [(total return in excess of T-Bill return)/standard deviation)]. XHE is generally higher return than SPY and XLV, but is also more volatile. However, its Sharpe Ratio (return you get for the volatility of the ride) is competitive with the S&P 500. This next table presents some comparative valuation and fundamental data. XHE has higher valuation ratios, lower yield, lower ROE and ROA than the S&P 500 and its health care sector, which are risk factors. It has somewhat lower debt. The following table shows a “growthier” XHE, compared to the S&P 500 and its health care sector. 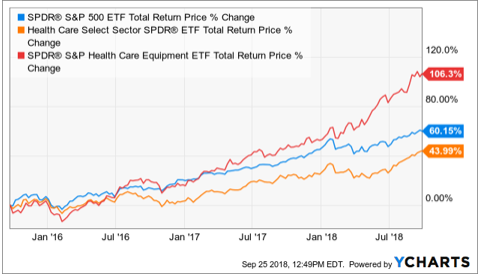 Its 1-year PEG (P/E divided by 1-year forward earnings growth expectations) is competitive with the S&P 500 and better than the S&P 500 healthcare sector. State Street Global advisors forecasts a 14.6% 3-5 year earnings growth path for the health care sector versus a 13.4% path for the S&P 500. 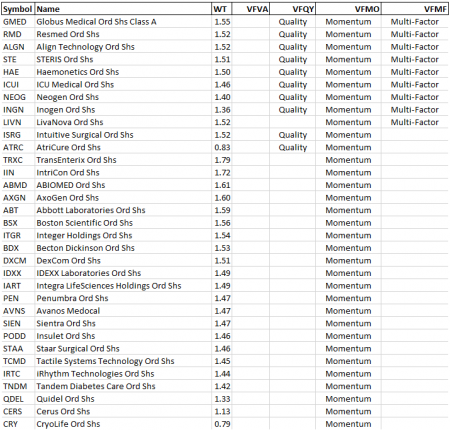 Looking inside of XHE’s 74 holdings, and comparing them to the holdings of factor funds operated by Vanguard, we see that 33 of them accounting for 48% of XHE assets by weight are included in the portfolio of VFMO (Vanguard’s momentum ETF based on the Russell 3000). We also see that 9 XHE holdings (16% of its assets by weight) are included in VFMF (Vanguard’s multi-factor fund, also based on the Russell 3000). 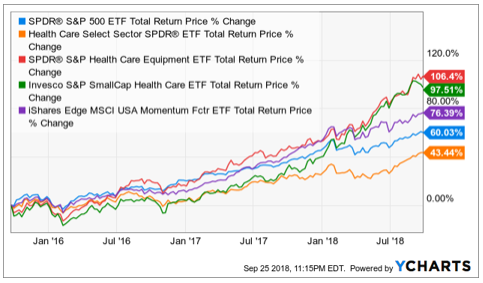 The multi-factor fund holds stocks that present a balance of attributes between value, quality and momentum, after excluding the most volatile stocks. Including those not seen, 3 of the XHE holdings are in the Vanguard value factor fund (VFVA) and 21 are in the Vanguard quality factor fund (VFQY). We do not commit to publish an article when this position is closed. We may do so, but make no promise to do so; and even if we did it may not be timely. If you take a tactical position in any security mentioned here, do not rely on a subsequent article to notify you of a change in our position on the security. We, of course, keep our clients advised of any changes or actions on a timely basis. This entry was posted on Wednesday, September 26th, 2018 at 2:21 PM and is filed under tactical momentum. You can follow any responses to this entry through the RSS 2.0 feed. Both comments and pings are currently closed.